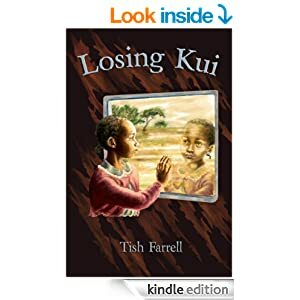 Posted on February 9, 2019 by Tish Farrell	This entry was posted in Creativity, Gardens, Humour and tagged #6WS, allotment, cooking, squash, Tish Farrell Writer. Bookmark the permalink. We have five pumpkins on a vine that is sprawling over the veggie patch. Nothing as grand looking as this beauty, but they’ll be ready in a month or two I hope. BTW .. there is something a bit weird about anthropomorphising vegetables … especially when you talk about cutting ”him” up. How wonderful to see your labours rewarded! You had me at soup … and the roasting with dates sounds rich and satisfying. Far greater rewards for having grown the beast yourself! The menu sounds delicious and I love and agree with your “essence of things.” 🙂 Here’s to many more crown princes and their relatives, especially when homegrown. I so enjoy the way you use words! There’s that word again. I love it. I also enjoyed the photos. A sort of Sleeping Beauty story in reverse – all that breaking in and through to the heart of the matter. A satisfying soupy tale indeed – with a sequel yet to come! I like your take on it, Laura – a reverse-ish Sleeping Beauty. Yes, and heavens to betsy – more soup! “It’s amazing how much mileage there is in a pumpkin”, so lovely. Thank you, Amy. One does need a bit of sturdy feasting in the winter – not too much though otherwise there’s ructions in the wardrobe department. Looks just like a butternut squash inside – such a gorgeous colour. Hope it tasted as delicious as it looks! I envy you your veggie growing skills and I know how much hard work goes into keeping everything happy. It did taste good, thanks Jude. and surprisingly juicy (more so than a butternut) and this despite being indoors for months. It’s my first attempt at growing this variety, so I think it will become a staple. There are times, aren’t there, when only soup hits the spot. Such an appetising photo, the sliced open version, Tish 🙂 🙂 I have salt to go with, over at mine, but I’m really hankering after the dates, soy sauce version…. Me too on the hankering front. Must get to it. Lovely meditation on nature’s bounty and the simple joys of good food! Love the way you put that, Patti. Many thanks. Love the post, and totally understand battling with your largest knife. You almost need a sculpting chisel sometimes. And more than a little amazing how long these will wait and still be good eating! I was amazed. This is the first time I’d kept a squash for so long. I’m drooling Tish, the very thought of that yummy soup makes me hungry. I’m envious of your pumpkin harvest, we have tried 2 years in a row to grow pumpkins, Jack loves the whole plant, the leaves, the flowers as well as the final product. Must admit though I have reservations about it taking over so much of our small garden. Maybe it does not like our humidity. I do know the struggle to cut them open so, they do fight back…. I remember your last attempt, and Jack’s tower support, and wondered why it didn’t work. Too much sheltered humidity could have been a factor? Perhaps a more open aspect? In a pot in a sunny spot. I love squash. We had it for lunch today with pork cooked in coconut cream. Oh now that sounds good, Arlene. Oh my gosh, what was I thinking, I meant “it was yummy”. Thanks Tish. He’s a magnificent beast, even in the after life. 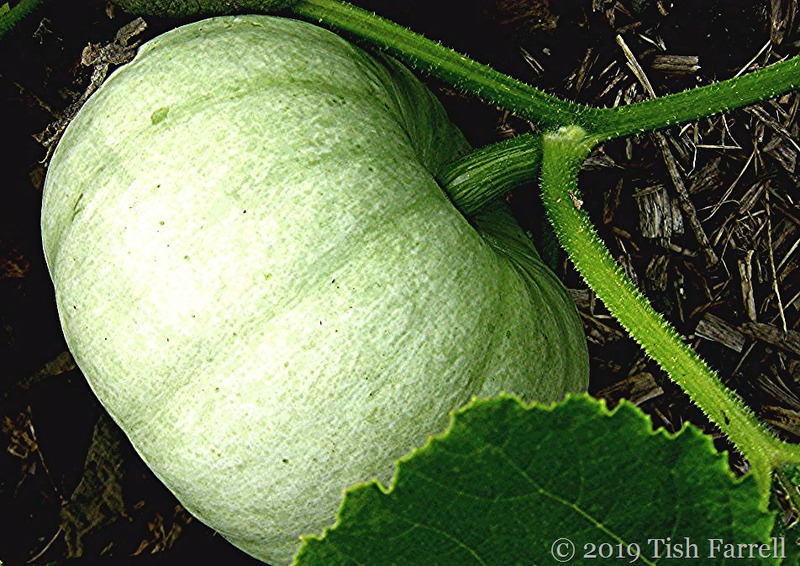 It you can grow zucchinis, squashes are much the same to grow. They like quite a bit of water, so plenty of compost in the planting hole is good for retaining moisture. Good to know! I will try planting them in spring. Compost and a lot of water. Check! Oh how I miss the bounty of my own personal garden! Luckily, we do manage to find delicious fresh veg in most ports. 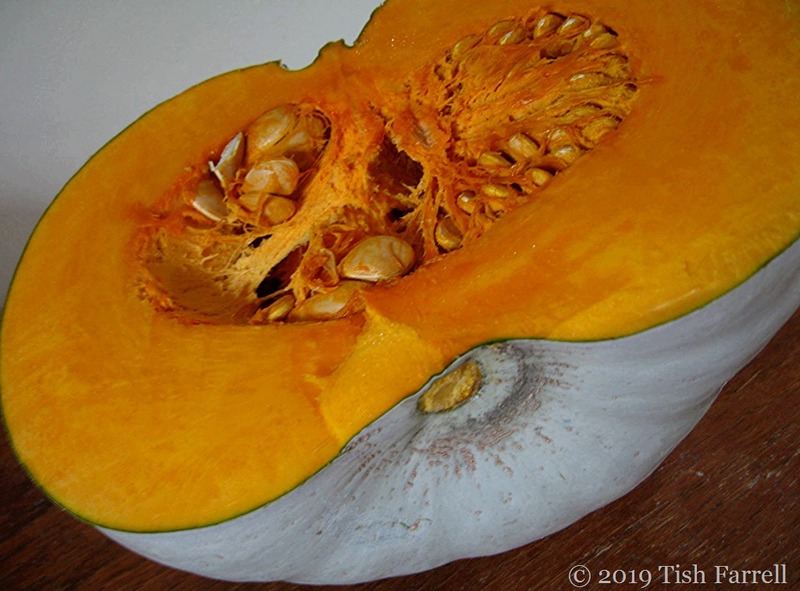 Squash (pumpkin) soup is a go-to passage meal for us as the gourd keeps long after many other fresh vegetables have given way to the elements. You got me longing to return to the sea with your posts of sea shadows and squash soups. We’ll be underway again shortly!